Over 65 percent of the population in the United States today are veterans of war or the spouses of veterans. And, more than a third of Americans age 65 and older are wartime veterans or spouses. These individuals may be eligible for a wide range of assistance and benefits programs available through the Department of Veterans Affairs (VA). After veterans are honorably discharged from the military, they can receive benefits for healthcare, pension, life insurance, burial and memorial services, and more. In regards to paying for senior care or long-term care, it’s important to understand the different VA benefits available. Veterans benefits for healthcare are separate from a private insurance plan. To be eligible for benefits through the VA, you must be a uniformed service member, a veteran, a dependent of a veteran, or a surviving spouse of a deceased veteran. There may be additional criteria such as wartime service, disability status, income and net worth limitations, and minimum duty requirements. Veterans who are at least 65 years old are 100 percent disabled, had served during wartime (regardless of whether they saw physical combat), and have no more than $80,000 in countable assets, not including a home or a car, are eligible for VA long-term care benefits. Older veterans need to have served 90 days active duty with at least one day being during an approved wartime. Aid and Attendance. This ongoing, tax-free payment is made to veterans and their current or surviving spouses. The most widely-known benefit, it is needs-based and offers the highest possible monthly payment to help veterans who need professional health care assistance with daily living activities, either through home care or in an assisted living community. Pension with Household Allowance (or Housebound Benefit). This benefit covers those who do not qualify for Aid and Attendance and wish to remain living at home or with a family caregiver. Basic Pension. This covers veterans and their surviving spouses who are 65 or older with limited income, even if there are no immediate medical needs. Your eligibility for long-term care services through the VA will be determined based on the level of care you need, as well as the availability of service in your location. 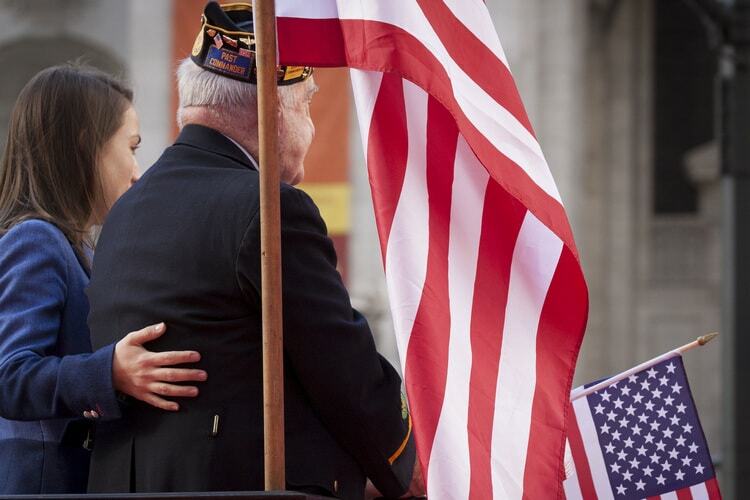 As part of the VA’s Geriatric and Extended Care Services, aging veterans can receive home and community-based services, such as in-home healthcare, adult day services, Alzheimer’s and dementia care, respite care, and hospice and palliative care. The VA also provides benefits for residential care settings such as assisted living communities and skilled nursing homes. For more information about your eligibility and veterans benefits for senior care, visit the VA’s website. Peabody Retirement Community is proud to accept veterans benefits and participates in the VA’s Aid and Attendance Pension in our assisted living community. For more information about assisted living services at Peabody and paying for senior care, please contact us today or call (260) 982-8616.